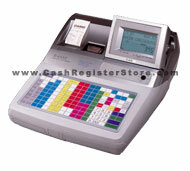 Casio TE-4500 Electronic Cash Registers at Cash Register Store. The Casio TE-4500SS features a base of 5,000 plu's standard and can easily be upgraded to 25,000 scanning plu's with a memory upgrade. A Metrologic MS-9520 laser scanner is standard with the package. There are many outstanding features which include a tiltable 5.2 inch wide color LCD screen with 2 lines x 16 characters and a 1 line numeric operator display offer the customer a clear view of transaction information. Choose from 5 selectable colors for the LCD display. This LCD screen displays characters larger than any other cash register system which is great for people with limited vision. A full flat spill resistant 106 PLU keyboard distinguishes the Casio TE-4500 from the TE-3000 cash register. The flat keyboard configuration caters to the hospitality industry as generally more keys are required for a larger number of menu items then standard raised key cash registers. The spill-resistant keys help protect against accidental spills on the keyboard from leaking into the circuitry damaging the main board.